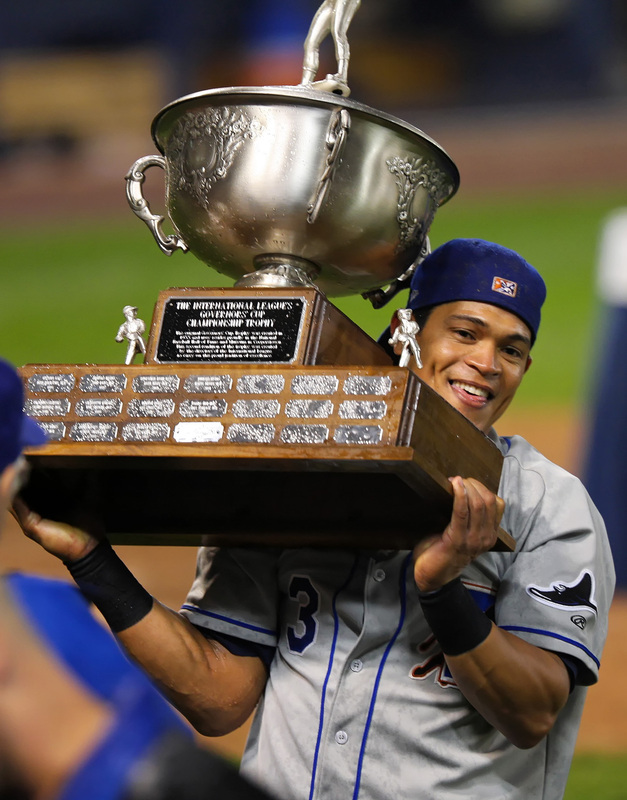 The International League has put up their background piece on the playoffs and I commend it. Tickets for the potential games at the DBAP September 4 & 5, and 10 & 11 are on sale. An oddity about this competition is the apostrophe, which an awful lot of folks get wrong. The Cup really is named after a bunch of governors. 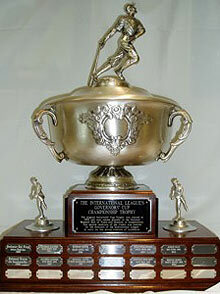 Specifically, the Governors’ Cup is named after the Governors of Maryland, New Jersey, New York, and the Lieutenant Governors of the Provinces of Quebec and Ontario. That was back when the International League had teams from those places (1933). The Bulls have brought home the trophy three times: 2002, 2003, and 2009. The original trophy is in Cooperstown. The one that gets handed around is a replica. Here's Ray Olmedo, who was just in town with the Rochester Red Wings, hoisting the trophy in 2009. West Division champs play South Division Champs best of five. South hosts first two games (Sep 4 & 5), West host rest of the games. North Division champs play Wild Card best of five. Wild Card hosts first two games, rest at North champs. The North Division/Wild Card competition is wide open and lends itself to charts. We will be posting a regular update as the rest of August goes along. West/South Div winners host North/Wild Card winners Sep 10, 11. Rest of games at North/Wild Card winners site. An interesting and sort of fun feature of the Governors’ Cup playoffs is that more often than not the players on the teams in the playoffs are not the players that got the team to the playoffs. That’s because the playoffs come after September 1st when the major league clubs can expand their active rosters from 25 to 40 players. The received wisdom is that the team with the best chances in the IL playoffs are those with 1) the better manager/coaching staff, 2) the better AA players, and 3) recent wins. But there may be more to it than that. Deep within a recent Bull City Summer piece, Adam Sobsey reports differences in locker room feel between this team and one from a couple of seasons ago. For the fans the nifty part of playoff games is that you have the DBAP to yourself: 3,000 or so in attendance is pretty normal and you can be sure that they are all deeply interested in the game. Assuming it will be the Durham Bulls against the Indianapolis Indians for the September 4-5 games, you can bet that you will be sitting among folks you’ve been seeing at the park all year. The winner of the Cup gets to play in the Triple-A Championship, which is a one-game, painfully obvious media gimmick. Considering that the Bulls have the best record, it's unfortunate that the IL doesn't award home-field advantage based on regular-season record. It seems silly to have this predetermined before the season. I think I agree. Plus there's the oddity that the first round wild card/division champ games could easily be teams from within the same division who have played each other a bunch of times. Remember, however, that these are the same guys who put together a schedule where the Bulls played 24 games without a break. In a way, this year seems to me the Bulls do have a home field advantage. If they can take the first two games, then they just have to win one on the road. If they split, of course, not so good. I assume the IL does this in advance so that the parks can schedule other events. In MLB the park is primarily used exclusively for the team, but you've seen all the college and USA baseball the DBAP hosts. I assume it's the same at other places. With a rotating schedule it's easy to keep 4 or 6 days a year clear rather than keeping the whole slate open. Had not considered Chris D's point. As far as this year is concerned: a Bulls employee mentioned that the playoffs are going to really mess with the rehab schedule. The contractor is to start work as soon as the season's over.